Did you know that May is National Salad Month? It’s also National Hamburger Month, so go figure. In honor of the former, I’m sharing my current go-to salad, which showcases my new favorite food, sweet potatoes. I used to eat these potatoes sparingly since I'd only seen them in fry form, but thanks to Pinterest, I now know that there are plenty of other delicious (and healthier) ways to prepare these roots. Plus, they're packed with beta-carotene, which is supposed to make your skin glow (sold). 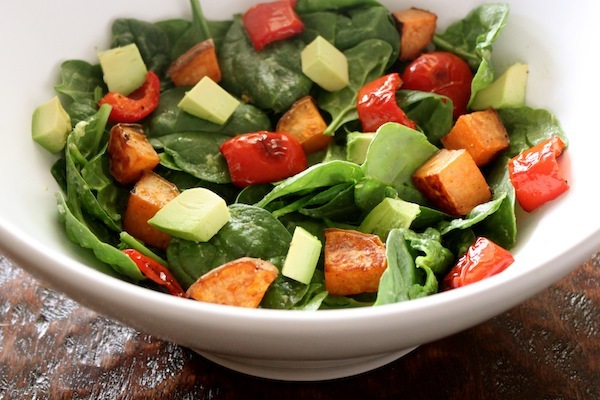 In addition to sweet potatoes, this flavorful salad is filled with more vitamin-rich foods like red bell pepper, avocado, and spinach. The oil-free dressing is a simple combination of raw apple cider vinegar (praised for promoting digestion; I get Bragg Apple Cider Vinegar at Whole Foods) and, don’t freak out, nutritional yeast. I know it sounds terrifying, but this yellow powder has a delicious cheesy flavor and is a great source of amino acids and B vitamins (hello, healthy hair!). This vegan, gluten-free salad is so satisfying that regardless of what month it is, trust me, you won’t want a burger. Tip: Buy organic sweet potatoes and leave the skin on for even more nutrients. 1. Preheat oven to 425 degrees. Place sweet potato and red bell pepper pieces on a rimmed baking sheet, and toss with olive oil, salt, pepper, and red pepper flakes. Roast for 25 minutes, turning halfway through roasting. 2. Dress spinach with raw apple cider vinegar and nutritional yeast; I pour each directly on top of lettuce, separately, then toss. 3. Add roasted sweet potato, red bell pepper, and avocado. Season with additional pepper to taste. Note: While eating this salad, I also like to mash some of the avocado chunks and mix them around to make things extra creamy (while not as pretty, it's delicious). Or, if you don't have (or care to try) nutritional yeast, skip the dressing and throw in a scoop of guacamole. The photo you took of this salad is really beautiful! I love the vibrant colors. Great shot! looks delicious except I'm allergic to peppers... I have been trying to (unknowingly) get on board with salad month though and had a lovely peach, avocado, cherry tomato & king prawn salad today - yum. That salad sounds so delicious! I'm so sorry to hear that you're allergic to peppers! A great substitution for them in this recipe is one large parsnip and/or a couple carrots (peeled and cut into 1-inch pieces). I love peppers, but when I feel like changing this salad up a bit, I swap my red pepper for more root veggies! You'll have to let me know how it goes. I hope you love it! Hooray for alkalizing foods!